Today I wanted to talk about food preparation and presentation. One of the keys to healthy eating is to plan ahead. I thing we all know that the hungrier and busier you are, the easier it is to just reach for the most convenient thing to eat. 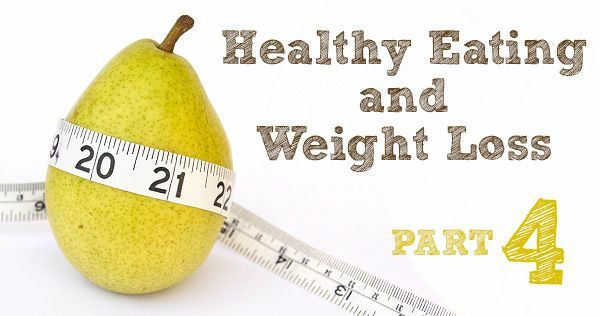 The key to success is making healthy options the most convenient choice, rather than something that will take more time and energy when you are lacking either or both. I am a huge fan of freezing food. We are a family of four but even recipes that serve 4 result in one portion being left over because the boys will usually share a portion. I like to freeze the fourth portion for days when Grant is on shift and I don't feel like cooking only to have the boys moan about what I make (like they always do). I can pull a WW friendly meal out of the freezer for myself and make something easy for the boys that they will enjoy, like beans on toast. Grant can also take a frozen portion to work with him and I know he's having a healthy home-cooked dinner rather than getting take-out or eating sandwiches. 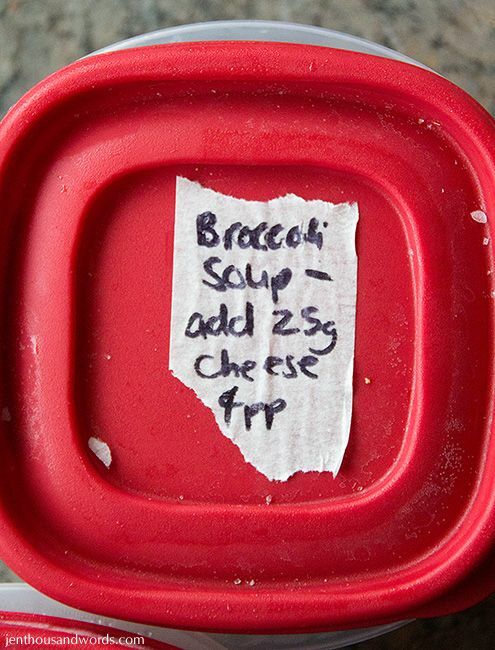 A strip of masking tape slapped onto any container makes an easy (and easily removable) label - this one is for soup that is frozen without the cheese, which is added after thawing and heating so I've included that note. I've also got the points value (4 ProPoints / Points+) and I usually add the date as well. You can freeze pretty much anything. If a recipe calls for 3 tablespoons of low-fat sour cream, I use that much and then throw the rest into the freezer for next time so it doesn't spoil. I portion leftover buttermilk into silicone muffin pans and freeze, then pop out the frozen blocks and store them in a plastic container or bag. I freeze lemon zest in ice-cube trays, adding just enough water to enable the zest to freeze solid as one lump, then transfer into a container or bag. You can freeze leftover cooked meat and vegetables. Baked goods freeze very well. I even freeze leftover buttercream icing in ziplock bags. I soak and cook black beans (you can't buy them canned here) and freeze them in portions. We visit a clearance store and buy things like pesto, ham and cheese and freeze them. 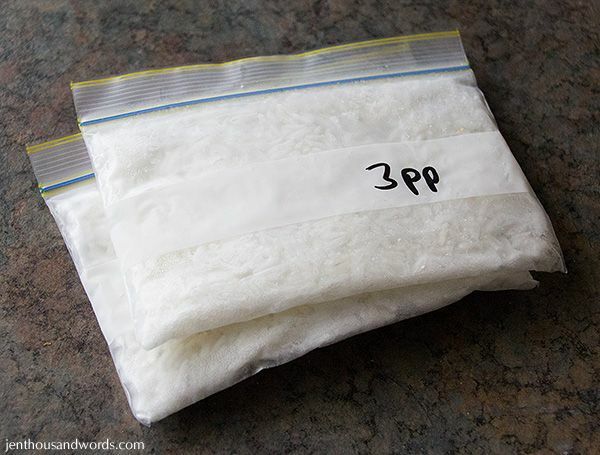 I like to pre-cook a huge batch of rice and freeze 3-point portions in snack-sized ziplock bags. 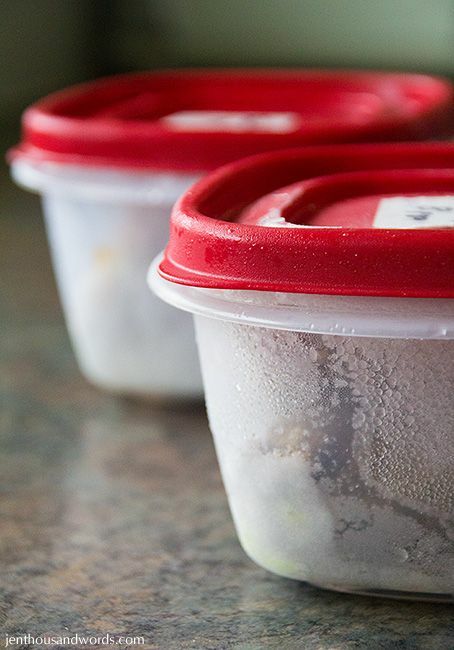 Setting aside some time to cook meals specifically to freeze may seem like a luxury, but it will save you time in the long run. 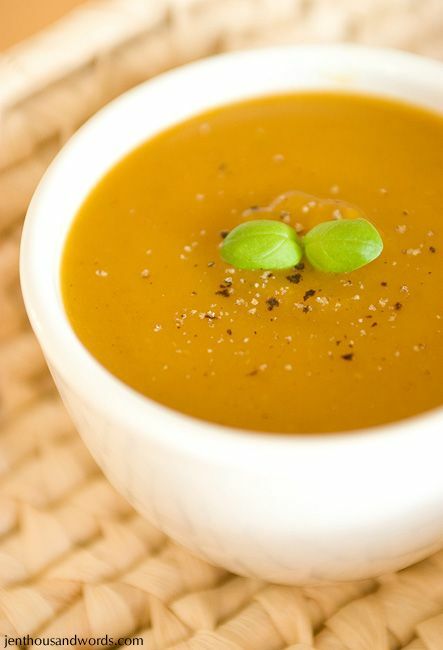 Would you rather set aside an hour to make a triple-batch of soup to freeze in individual portions for lunches, or would you rather stand and cook soup every single day? Of course you wouldn't want to cook every single day ... but if you don't have the frozen soup to fall back on you might be more likely to reach for less healthy but more convenient options. If you're cooking dinner anyway, you might as well double the recipe and freeze the extra portions. It generally won't add any extra work or time (okay, maybe a few minutes extra if you're chopping two onions instead of one, for example) and the payoff is so worth any extra effort. Our portions are often influenced by the size of our plates. Empty space on a plate sends a subconscious message that we don't have enough food and we tend to want to fill the plate. You can control your portion sizes, or make your pre-weighed or pre-measured portions seem more satisfying, by putting them on smaller dishes. It kinda looks like a snack, doesn't it? I want to put something else on the plate to fill the empty space so my food doesn't look so lonely! You'll notice this principle with cereal if you use a regular cereal bowl and just pour what you think is a portion, and then switch to a regular cereal bowl with the recommended serving size weighed out in it and compare the two. I typically eat 40g (1.4oz) of cereal for a serving, as it's 1 ProPoint / Points+ per 10g, then another point for the skim milk. 40g of cereal in a regular cereal bowl can seem a bit meagre, especially if it's a heavy cereal like granola, but it looks like a satisfying portion in a smaller bowl. 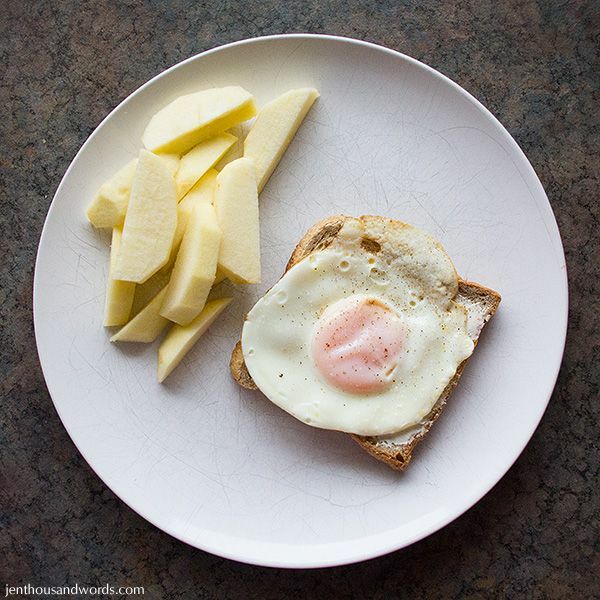 If you don't weigh or measure out your food then switching to smaller bowls and plates will almost certainly make a difference to how much food you eat. 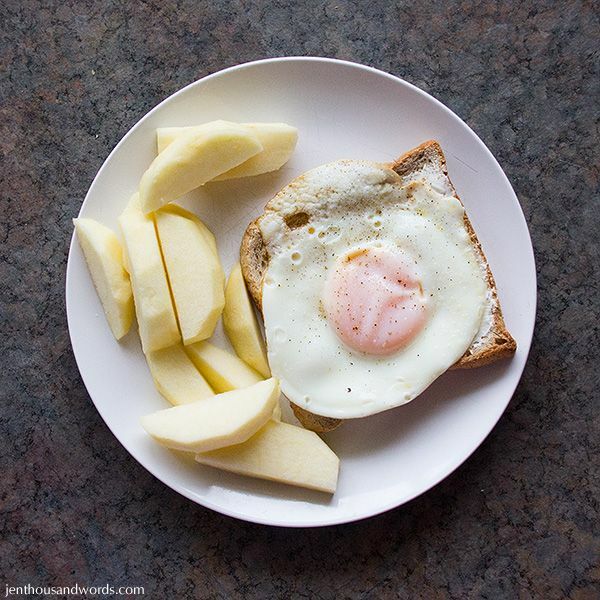 I know that fooling your eyes doesn't fool your stomach and the volume of food is the volume of food, but it does make a difference to how you feel about your portions, whether you feel deprived or satisfied, and how appealing a portion can look. Mind-set makes a difference, I promise. Speaking of portions, it helps to pre-portion any snacks you might reach for when hunger pangs strike. Almonds are a great protein-rich snack but can quickly rack up the points if you are just munching straight from the bag. As you can see above I like to weigh out 3-ProPoint / Points+ portions (20g, for those who want to know) and have them handy in my pantry for when I need a quick protein hit. Fruit is sometimes already pre-portioned by nature, for instance in the case of apples, pears, bananas and the like. But things like grapes, melon or pineapple aren't. When you bring your grapes home from the store, try setting aside ten minutes to pull them all off the stems, rinse them, dry them (put a clean tea-towel into a bowl and put the drained grapes into it and roll them around gently) and leave them in a container in the fridge. You are more likely to reach for a handful of grapes if they are ready to eat. The same goes for melon - peel and chop your melon and store in the fridge in portions or in one big container and you will find it so much more convenient to snack on. It's sometimes tempting to treat ourselves with food, especially if we're tired, stressed or emotional. You can make yourself feel spoiled and treated by using adorable containers that make you happy. Okay, they won't turn your carrot sticks into chocolate, but you can get that pampered treat-yourself feeling if you use something special. 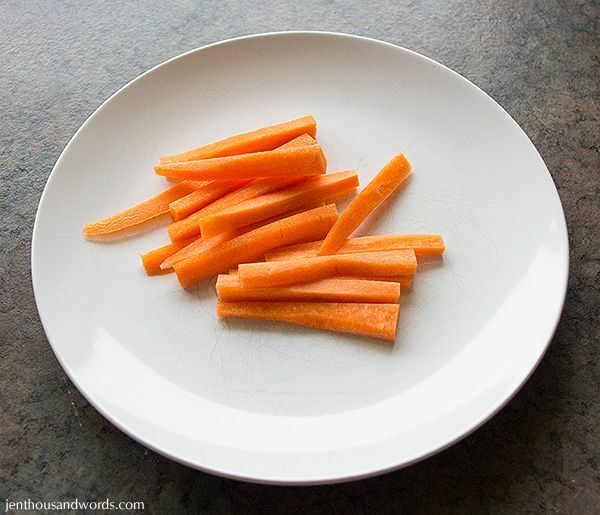 Here's an example: These carrot sticks look kind of boring just thrown onto a plate. They look a little more glamorous sprouting from a mercury-glass votive. If you drink water all day every day, why not treat yourself to a beautiful crystal glass, stemmed or otherwise. Vintage teacups make beautiful bowls for grapes, nuts, carrot sticks, or hummus. 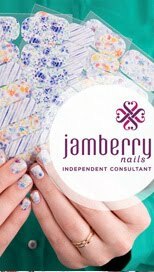 Eat your crackers, sliced fruit or other snacks off of gorgeous patterned saucers or side plates. Hunt down adorable egg cups or votive holders to contain smaller portions of snacks or dips. Little milk glass bowls and compotes make sweet snack containers. Tiny flowerpots are adorable for holding fruit, nuts or crackers. These items can be found at thrift stores if you don't want to spend a lot, or else splurge on an expensive glass, bowl, cup or plate from a high-end store for the real feeling of luxury and indulgence. Sure, $14 might be expensive for a small plate from Anthropologie, but you're only buying one so it won't break the bank the way buying a set of 12 might. And only having the one of its kind in your home will make it that much more special. Another way to make your food feel special is to take an extra moment to garnish and present it well, even though you're just presenting it to yourself. A sprinkle of spice, a sprig of herbs, the lightest dusting of powdered sugar - all of these tiny touches make your food look a little more interesting and appetising. 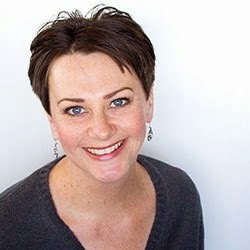 You'd do it for your guests - don't you think you deserve the same? It creates a mindset of valuing your food, rather than feeling deprived. I do love ziplock bags for storing food but am concerned by the fact that they are not BPA-free plus I am opposed to spending money on things I am just going to throw away. 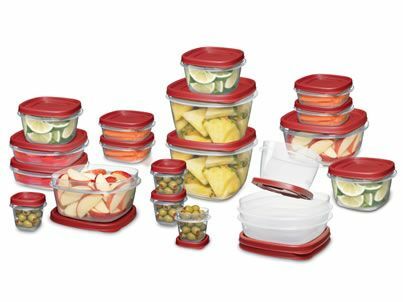 My favourite and recently-discovered containers are by Rubbermaid and they are the Easy Find Lid range. (No, Rubbermaid do not know about me, I just love this product). You can see them in the pictures above; here is what the full range looks like. I found these in my local Pak-and-Save store. They are inexpensive ($1.80 each, or $1.80 for two of the tiny ones). 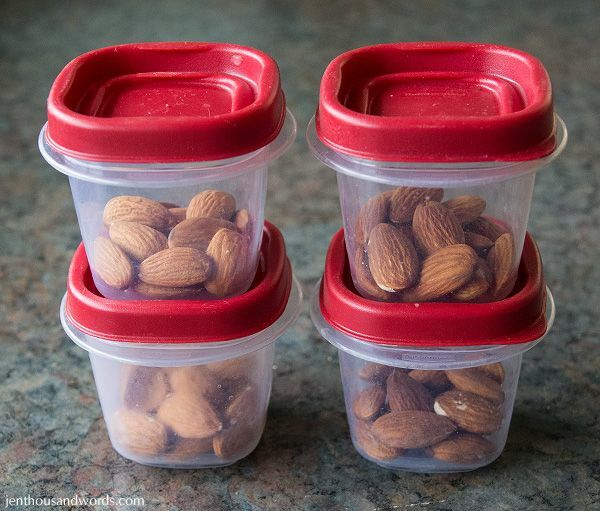 They are sturdy, BPA-free and durable and the best part is the lid actually snaps onto the bottom of the container so you can sturdily stack them, or just snap the lid to the bottom of the container so it doesn't get lost. I use the smallest containers (half cup) for portioning out snacks or rice. I have slightly bigger ones (1.25 cup) which are perfect for one-and-a-half bananas, which I feeze for my milkshakes, or smaller meals. And then the biggest ones I use (2 cup) are just right for regular meal portions or soup. 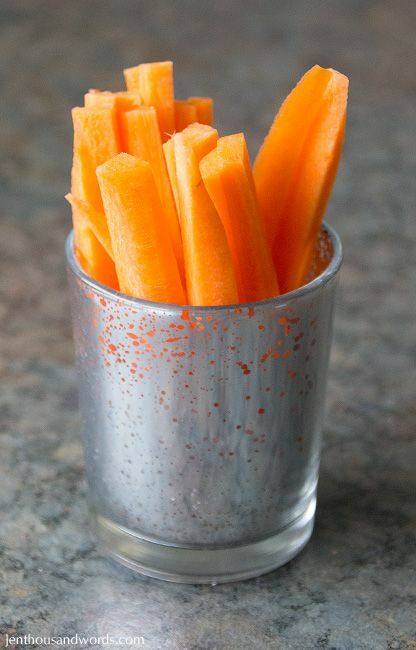 Have you tried pre-portioning your snacks? What do you like to freeze? Have you tried these containers and do you love them?